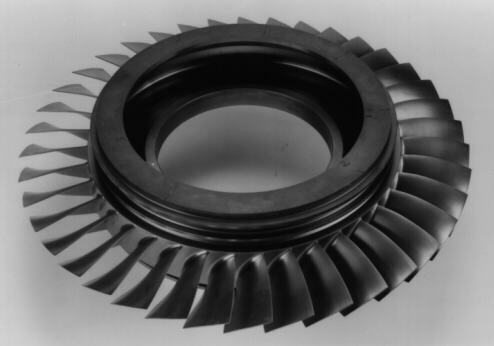 Highly-stressed rotating components of jet engine compressors are often made from titanium alloys. For welding these components, the electron beam (EB) welding technique is favoured for its advantageous welding properties. When these components are welded, undesirable gas pores of sizes up to 0.5 mm dia. may be produced, especially when large sections are involved. Generally, these pores can be detected by ultrasonic inspection. In the assessment of ultrasonic inspection data, a major parameter apart from the incidence and spatial distribution of flaws is the detectability of pores, or POD (probability of detection), as a function of pore size. This investigation was carried out to study the detectability of pores in titanium alloy welds by the ultrasonic immersion technique. High-definition radiography (HDR) was used as a reference method. (ii) the a-versus-a relation for the round bottom holes is not linear on a logarithmic scale, as would be expected, and the POD results vary widely with the decision threshold selected. Further work on these problems is planned. For joining highly-stressed rotating engine components in titanium alloys (Fig. 1), use is often made of the electron beam welding (EBW) technique. In the process, resultant gas pores 0.5 mm in diameter and less are impossible to safely prevent, especially when large-section weldments are involved. The high resolution ultrasonic inspection technique is generally suitable for detecting such pores. For conclusive evidence of the degree of reliability achieved in ultrasonic inspection, a test specimen was prepared and investigated. (ii) correlate flaw size "a" with its associated signal amplitude "a". In the present investigation, use was made of the latter of the two methods. Fig. 3 20 by 20mm area selected for POD investigation (The large-area indications do not represent pores, but cracks generated by extreme weld parameters. These cracks were not involved in the investigation). From a prior stress investigation, a number of radially EB welded ring segments containing a plurality of pores was available. These specimens were 15 mm thick and each had a weld in its centre, i.e. 7.5 mm from either face. Pores normally having no direction-related shapes, the direction from which the inspection is made makes little difference in ultrasonic inspection. This allowed inspectors to scan the weld plane with a focused sound field at an angle of 90° irrespective of conditions prevailing on the part (Fig. 2). The specimen was inspected by ultrasonic immersion technique using a 40-mm spot-focused 25 MHz probe. This technique is maximally compatible with the test objective and especially with the required degree of defectivity. Used as a reference standard was one each round bottom hole 100, 200 and 400 um in diameter. The gain adjustment was selected for the 400-pm hole to produce an 80% full screen height (FSH) signal. At this setting the amplitude of the 100-um round bottom hole reached 28.24 FSH. This value was first taken as a lower limit, meaning that all indications below it would not be assessed. But when it became clear that for the POD calculation, also smaller indications should be included, a limit was set a 10% FSH relative to the basic noise of the unflawed structure. The influence of flaw depth or depth position in the focused sonic field was considered by inspecting once with the focus in the weld plane and then again with the focus 1.5 mm behind it. To keep the number of indications manageable for quantitative evaluation, a 20 by 20mm area (Fig. 3) was later selected for comparison with the radiograph. To determine the POD, comparison is needed with a "true" condition as established by some independent method. The available specimen was perfectly suited for radiographic inspection, its pores all extending in a strictly confined plane, the fused volume. This permitted the radiated volume to be reduced by removing the remaining material to the thickness of the fusion zone plus a margin for a total of about 3 mm. In this manner, defectivity was maximized. The section was radiographed at 10X magnification. To resolve disparities in pore size data derived from radiographic and ultrasonic inspection, respectively, various indications were verified metallographically. It was then seen that the radiographic size data were essentially correct. The C-scan presentations were evaluated automatically using the module contained in the image processing system. The user here is required to insert an amplitude threshold, a minimum indication area and a minimum separation of indications to be assessed individually. The system then numbers the indications matching these criteria and displays their amplitude, surface expansion and coordinates. Following machine evaluation, a "manual" evaluation was made by an inspector While this is a rather lengthy procedure, it beats automatic evaluation, especially in its ability to separate closely adjacent individual indications. The 10X indications appearing on the high-definition radiograph were transferred to a transparent foil and registered with the accordingly scaled ultrasonic C-scan presentation. When the radiograph was evaluated, however, it was seen that estimating the size of some of the indications was made extremely difficult by the low contrast. For each indication, size "a" from the radiograph and signal amplitude "a" from ultrasonic inspection were tabulated for POD computation. For the purpose, the C-scan presentations were evaluated once automatically using the "ScanMaster" system and then again, for comparative purposes, manually by the inspector with an assist from image processing. Metallographic verification showed that substantial amplitude differences can occur even on apparently ideally round pores. This was impressively apparent on a 250 um dia. pore. Ultrasonic inspection should clearly have witnessed it, but the signal it produced did not rise above the basic signal threshold. Ultrasonic amplitudes were measured on round bottom holes 0.1, 0.2 and 0.4 mm in diameter (5 holes each size) arranged in a largely undisturbed area (Fig. 4). They scatter much less than the pore amplitudes. As it will become apparent from the graph. the relation between flaw signal "a" and flaw size "a" fails to show a linear relationship on a log-log scale. As the flaw size increases, the flaw signal grows at an increasingly accelerated rate. Obviously the physical laws in the large-size (say 0.4 mm) range of flaw are not the same as in the small-size (say 0.1 mm) range. involve two further thresholds: (i) signals below a recording threshold ath < adec cannot be distinguished from background noise and (ii) adoption of a saturation threshold asat takes account of the fact that the applicability range of NDT systems is subject to an upper limitation imposed by saturation behaviour. Assuming a normal distribution for the signals and a linear relationship between the logarithms of the mean of the signal amplitude and the actual flaw size, the POD is given by the hatched area (Fig. 5). Fig. 5 Schematic representation of POD model according to . Fig. 9 POD results from the weld pores for a saturation threshold of 95% and a signal threshold of 10%. (i) Owing to the relative moderate scatter of experimental data, the POD curves and the 95% confidence interval are spaced closely together. (3) as in (1), but indications evaluated by an inspector. Shown in log-log representation in Fig. 8 are only the data recorded above a signal threshold of 10% FSH. In all three experiments the signal amplitudes exhibited notable variations for the respective pore size. In the POD analysis (Fig. 9), this caused wide confidence intervals. The 95% confidence curves reached 90% POD not until pore sizes were 0.4-0.8mm, depending on the experiment. Since pores of these sizes do not occur in	the investigation, this finding invites critical analysis. At 25 MHz, the test frequency runs in an unfavorable range. In titanium, the wavelength will be about 0.24 mm at this frequency. This puts it in the range of expected defect size, which may give rise to amplitude fluctuations through interference. The use of appreciably higher frequencies is impractical. Lowering frequencies would impair the detection sensitivity, and is therefore unsuitable. An unfavorable constellation of two closely adjacent pores may cause interferences and so reduce the signal. The weld structure and the heat-affected zone are inhomogeneous. Here, too, interaction with the sonic front may be disturbed. The usefulness of ultrasonics for the detection of small weld pores in titanium alloys is limited, since on account of the large scatter of signal amplitudes the technique appears ill-suited to improve the confidence level and provide a reliable assessment of pores sizes under 0.4 mm dia. The presence of this size of pore, therefore, must be considered in the design of the weld. Since the POD model here used assumes a linear logarithmic relation to exist between amplitude (a) and size (a), the validity of the calculations for these experiments needs relativizing at least for the round bottom holes. On real pores, conclusive evidence of the linearity of the relation is prevented by the wide scatter. The selection of noise threshold adec has considerable bearing on the result and the evidence it provides. adec should therefore be selected judiciously and be based on empirical data and the ultrasonic inspector's expertise. The POD model used has recently come under critical discussion [2-4], with critical doubt focusing exactly on the linear relationship between system response and defect size. An attempt is therefore made to develop new POD concepts that take account of the actual relationship, starting with the physical method and its implementation . Playing a key role in the discussion is also the fact that flaws of like size can be expected to provide a wide spectrum of system response, as has been borne out by the present investigation. In  and , therefore, new recommendations are being developed that attempt to remedy the problem by making allowance for "effective reflectivity".